With the season of spring just started bringing a big relief from chilly winters, I am sure most of us would be considering planning a vacation somewhere away from home and work. I had the same feeling and this time it got me landed in Greece. One of the most popular tourist destinations in the world gets even more attractive in Summers. If you are in Europe then you are really missing something if you haven’t had Greece holidays in summers yet. In a time of economic crisis, the Greek government is trying hard to attract tourism in order to support its dying economy, so if you are thinking this year might not be the right time to come, you could be wrong. Though there are some negative changes as well, due to bad economic conditions (apparently the international train services have been stopped by the government). As a first time visitor to this country, I made a travel plan after doing some research. I was mostly interested in visiting various Greek Islands and so I divided my trip into two parts. First is from Athens to Eastern and Southern Islands, and second is from Athens to Northern and Western islands. When I landed in Athens I had a specific image of Greece in my mind. I was expecting the famous whitewashed homes with blue windows and churches with blue domes, but was surprised to see the regional architectural diversity. The new airport in Athens, Athens Eleftherios Venizelos International Airport, is one of the most attractive airports in Europe that I have seen. The airport was opened in 2001 as part of infrastructure improvements in preparation for the 2004 Olympics games. 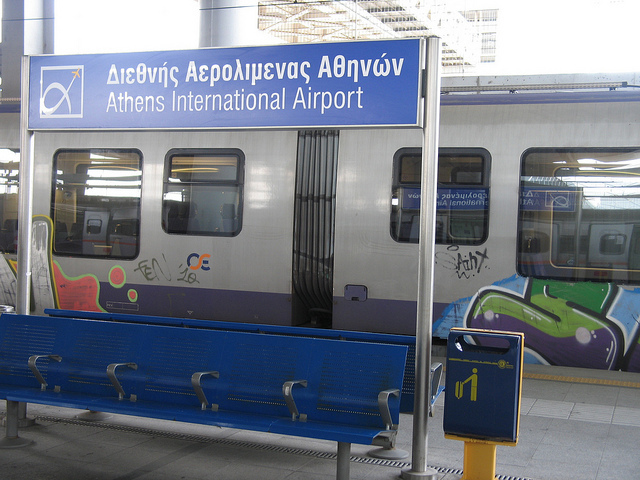 In my opinion, the best way to go to the city from the International Airport (27 KM or 17 miles) is by metro train for €8. Group tickets (2 or 3 people) are also available and they provide some discount. The airport Metro line is an extension of Line 3 (blue line) that takes you to the downtown Syntagma and Monastiráki stations. It was a great day at Athens, around 20 degree Celsius and sunny, though most pleasant weather occurs in May-June and September-October. It was nice to see that evening tends to get colder, the low levels of atmospheric humidity in most areas of the country preventing the air from trapping a lot of heat, and temperatures tend to dip to very pleasant levels in the evenings. Being a historical place and capital of Greece, you have lot of things to see and do in the city of Athens, but I had planned to do all that after completing the first part of my trip. After resting and shopping in the local markets of Athens for a day, the next day I planned to go to by ferry from Piraeus, the harbor of Athens, to the Mykonos Islands. There is another port, Rafina, on the west, from where you can reach Mykonos one hour earlier and, due to shorter distance, the ferry prices are also slightly lower. While Rafina is not that popular for travelling to one of the Cyclades Islands, for those who are going there directly after landing at airport, Rafina could be a better choice. 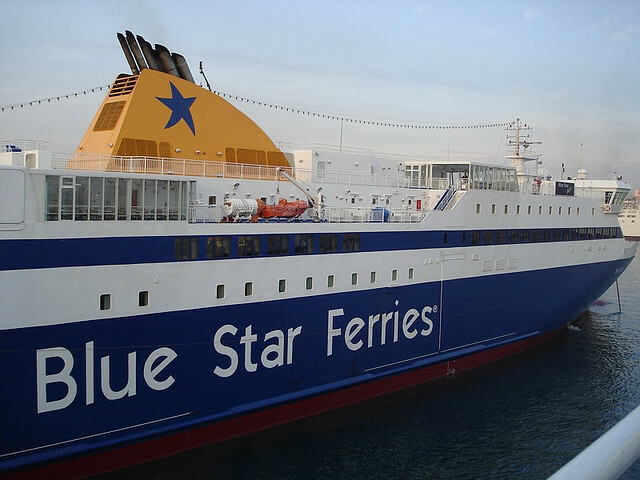 There are two types of ferries, normal and high speed ferries and travel time to Mykonos from Piraeus could range from 3 hour 30 minutes to 5 hours 15 minutes. Economy ferry is my cup of tea and I bought the tickets from the port on the same day. Those who are planning to be there in the month of August should buy tickets in advance, as it is tough to get availability due to festival rush (“Assumption of our lady” Festival). On a slow ferry, a seat in economy class may cost upto € 32, whereas on a highspeed service costs may go upto € 54.50. If you are going by slow ferry your departing port gate will be E1, otherwise, for high speed ferries, departing port gate would be E7. If you are going from Rafina port, the journey time could range from 2h 10min to 5h 30min, depending on the type of ferry you are taking. On a regular ferry ticket, costs may go upto € 23.50 per person for a seat in economy class; on a highspeed catamaran service expect to pay € 52.50. Mykonos is one of the most popular tourist destination in Greece. In fact, it is second most preferred tourist destination in Greece (I wonder which is on top? Will let you know as I write more in coming articles on my full trip). Mykonos is the island of youth and fun and it is sometimes also referred to as ‘Ibiza of Greece’. The island is famous for its picturesque towns, all day and night parties and beach sports. Follow this space or Subscribe to TWR Travel via RSS, as I continue my journey to the Greek islands, you should not miss the main attraction of Greece. I am a passionate traveller and wish to travel all around the world! Playa Mujeres, located north of Cancun, is an ideal Caribbean escape for travelers in search of more seclusion. Atelier de Hoteles has exactly what you need to experience luxury in Mexico: playa mujeres all inclusive resorts. ATELIER de Hoteles®, the most innovative Mexican hotel chain, announced it will be soon be starting operations in its luxury ATELIER Playa Mujeres® hotel, programmed for April 15th, 2019. This modern “All Suites” hotel is designed for adults (16 years of age and over) and is located to the north of Cancun. Offering a spectacular beachfront, it is inside the idyllic Playa Mujeres tourist complex which boasts a magnificent 18-hole golf course designed by Greg Norman. “With ATELIER Playa Mujeres® we have revolutionized the concept of the hotel industry in Mexico. We celebrate contemporary Mexican art with a captivating architectural design and an authentic atmosphere that is reflected in every corner of our hotel. Our ‘Handmade hospitality’ is remarkable for offering first class, personalized service in a setting of relaxed luxury and vibrant gastronomy surrounding guests with a totally technological experience, generating extraordinary and memorable moments,” commented Oliver Reinhart, CEO of ATELIER de Hoteles®. ATELIER Playa Mujeres® resort seeks to seduce its guests by offering them the opportunity to experience contemporary Mexican art, technological innovation and stylish architecture, with 431 suites in different categories offering spectacular views of the Mexican Caribbean and Isla Mujeres. This new resort has reinvented VIP treatment with a particularly innovative, avant-garde concept under the slogan “Addictive Service® in its special INSPIRA® category. This combines luxurious interiors with select original works of art and the highest quality materials that are on a par with personalized services such as: private check-in, butler and golf concierge. There are also exclusive in suite amenities, as well as services such as Tablet on Demand, Pet-it® and Gourmet-to-Go®. ATELIER Playa Mujeres® offers an extraordinary gastronomical experience with 8 restaurants and 8 bars. Among the culinary options guests can find flavors from Italy, contemporary Asian food, a health bar, fresh fish and seafood, a buffet restaurant that evokes the delicacies of a Mexican market, a South American restaurant with meat cuts, and even an authentic taco restaurant. Maria Dolores is the hotel’s outstanding flagship restaurant offering a menu of original dishes inspired by appetizing Mexican cuisine, created by the skilled hands of renowned Celebrity Chef Edgar Núñez, who is listed in the rankings of “The World’s 50 Best Restaurants” and “Latin America’s 50 Best Restaurants”, in positions 64 and 11 respectively. In order to pamper those who seek the best in events, the spectacular ATELIER Playa Mujeres® Convention Center offers 4,500 m2 of available space in different multi-purpose rooms, with a spacious air-conditioned foyer, fully equipped with state-of-the-art technology, as well as specialized services to ensure groups and conventions leave with an unforgettable experience. The expert team of Wedding Planners satisfies the needs of those looking for a really momentous celebration, both in its rooms and the rest of the facilities. Similarly, the 3700 m2 of the NUUP Spa®, ATELIER Playa Mujeres® own brand, offers 18 individual and couples’ booths equipped with the latest massage beds for all kinds of treatments and services, multiple pools, extensive sauna and steam areas, hydrotherapy circuits, among other facilities, all geared to offering the highest level of well-being to those who want to pamper their body and mind. Faithful to their cornerstone concept of “Surround Technology®”, the hotel will begin operations with one of the most innovative Apps in the hotel world, the first in Latin America that allows guests to use their smartphones as suite keys. This technology also offers television guides, activities, events, three dimensional maps and a direct line via their telephone or chat with the concierge department; it can also offer augmented reality tours and enable guests to consult information on restaurants and works of art in this Playa Mujeres luxury all-inclusive resort. Both the opening of the ATELIER Playa Mujeres® and the inauguration of the ESTUDIO Playa Mujeres®, programmed for the first half of 2019, represent a fundamental step in the consolidation of ATELIER de Hoteles® as one of the most ground-breaking hotel chains in Cancun and Mexico. The Costa del Sol is a great choice of holiday destination. With many great places to see, absolutely glorious weather and a chance to enjoy the famous Mediterranean lifestyle it is perfect whether you are travelling with friends, as a couple or with a family. Whether you are heading to Torremolinos, Marbella, Nerja or the city of Malaga, where the international airport is, the best way to make the most of your stay and give you the freedom to really explore the region is to rent a car. There is a lot of choice for car hire in Malaga airport, so here are some tips for getting the deal that is right for you. Thinking about your budget, you can aim for a smaller car, such as the Toyota Aygo or the Fiat 500. Absolutely perfect for solo travel or as a couple. However if you are travelling as a family, these smaller cars might not be right, especially when you have a lot of luggage to carry. But there are still some very good deals to be had on medium size cars like the Ford Focus or Nissan Juke. However, if comfort is your top priority, and you want to drive around in style, then consider models like the BMW X5 or Range Rover Evoque. You will need to be sure to add on any additional items you might need for the length of your hire. For example, if you would like more than one driver you will need to let the rental company know so that they can be included in the hire and therefore included in the insurance cover. You should also be sure that you ask for child car seats, and that those car seats meet safety standards. It is often possible to hire a GPS loaded with local maps as well, that can be very handy when driving in a new country. You should also double check the insurance details. The basic insurance might be great value, but it will usually only cover injury to passengers or theft of the vehicle, and won’t cover any damage. Event the theft cover will likely mean a very large excess will need to be paid. However opt for a package with full cover and excess protection and you will have far great peace of mind. There is nothing worse than finally reaching your destination, queuing at passport control, waiting at the baggage collection point and then having to spend ages in a queue for car hire , when all you want to do is go and enjoy your holiday. If you book online in advance you will not have to worry about all of that. You can simply head to the car pick up point, usually via a free shuttle bus that online takes a few minutes, and then be on your way to enjoying yourself. This can make all the difference to your holiday. There are over 100 car hire companies at Malaga airport, however not all of them are able to offer good prices, good quality vehicles and excellent service. Also if you are travelling at night, or your flight ends up delayed you want to be sure that this will not cause any problems for your rental. So be sure to choose a company that has a helpline telephone number open 24 hours a day and seven days a week.